Door locks take up one part of the hardware industry, compared to other building materials, such as floor and wallpaper, door locks’ development is not fast in brand promotion, so there are less famous products, and the products are coming from Zhejiang province、Guangdong province、Shanghai district and Shandong province, the marketing is not balanced with bad competition, meanwhile low quality and copy products are destroying the marketing. 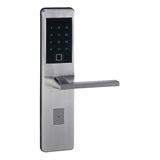 Two types of products are selling in the marketing mainly, one for traditional mechanical lock, the other is electronic door lock(code lock、hotel lock、sauna lock and fingerprint lock, etc. ), they have different market and customers. Actually, the mall is the first way to promote door locks products, but bad products affect the balance, customers could not tell them, for manufacturers they are not dare to solve the problem because of the profits, so the brand building is hard to execute, the marketing is out of control. In every field, the problem makes them go, and the key is facing it. Today the government has to do something for this result, for example, creating the good competition atmosphere and checking the bad producing way from the nonstandard workshop and issuing the available product quality system, surely, the government also needs to insist on the policy and do not let bad products appear in the market and show the power of the law, especially for the fake goods, then the door locks field would develop well, China will have great and well-known brand and field’s model.